I had to dig deep into the bag of tricks this week to come up with a new idea for finshing off my latest three-panel wall hanging. Two days of experimenting with the structure that I had hoped to use for the two outer red panels finally led me to the conclusion that it just was not going to be as I had envisioned. It was time to plan again and take a look at all that I have at my disposal in my “bag of tricks”. And there is a lot of stuff in that bag of tricks after having spent almost 18 years now studying weaving techniques and simple looms used in South America. The main panel for the wall hanging is now finished. I can’t cut it off the loom yet to better show you the stepped effect of the woven fringe as I will need to place the two red panels, when I am done weaving them, on this same loom and then twine across the top of all three to join them together. It is always fun turning a finished piece over to look at the other side. 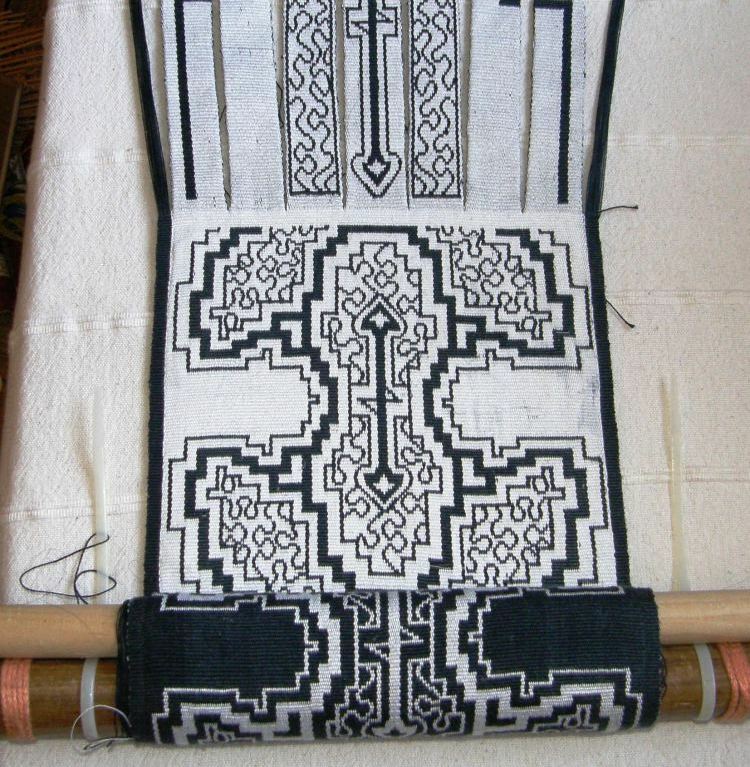 I have been looking at white squiggles on black for so long now as I inched my way through this weaving. Yes, literally inched. 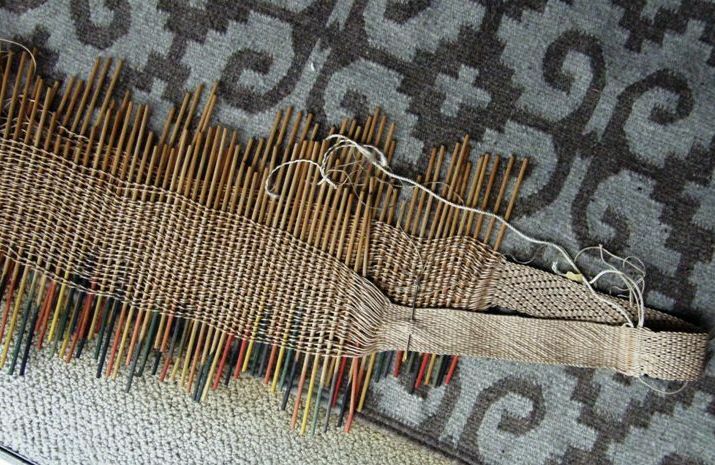 I took note of my progress on the woven fringe part and it was pretty much an inch a day. This side actually looks more like the painted Shipibo cloth that inspired this project. It is much more common to see light cloth with dark lines. But I don’t have to make any decisions here about which side to show. It needs to be the dark side in order to match the other pieces in this wall hanging series. I want this second wall hanging to represent the weavers of the tropical lowland regions of Peru. 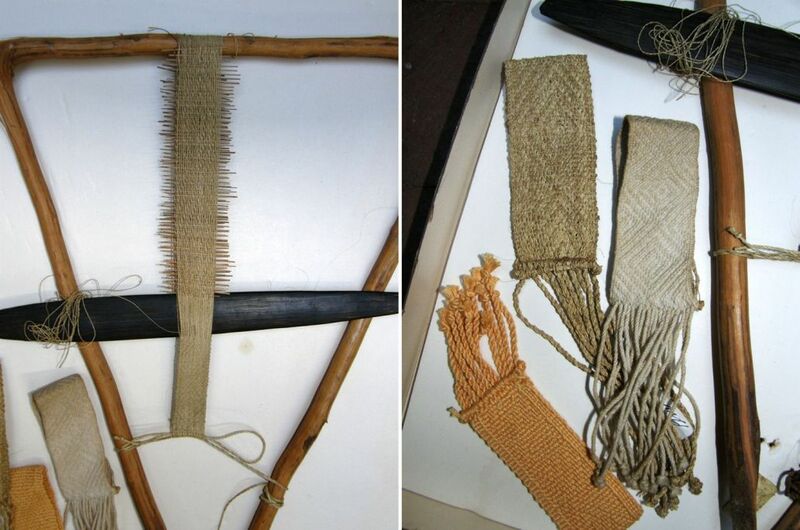 For that reason I had chosen to use the structure that is used by people of the upper Amazon Basin to make wristlets. I have never been to that part of Peru and so was relying on a sample that I had been given from the work of Nora Rogers and Ann Blinks as well as notes by Cheryl Samuel in order to reproduce the structure. I bought red hemp twine for this project while in the USA. 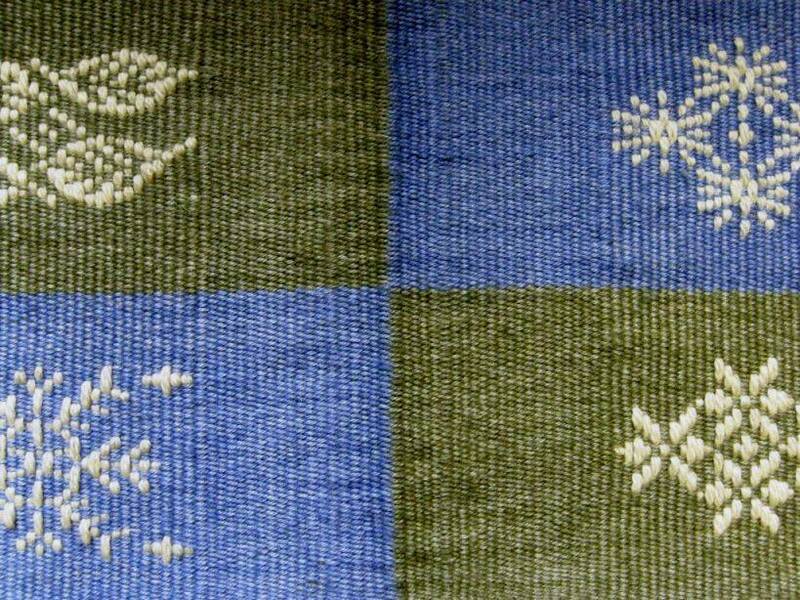 The weave is based on having twined warp threads lying next to what Samuel calls a “half basket weave”. I did succeed in reproducing the structure but the hemp twine did not give the design the relief that I had been hoping for. It was just a flat red mass at which I had to peer in just the right light in order to make out the pattern.I tried all kinds of weft and beat but I simply could not get the desired effect. Nevertheless, I found myself sitting alone stupidly squealing with happiness as the piece started to take shape. It was a joy just to able to reproduce it but a disppointment not to be able to use it in my hanging. Back to the drawing board. I wanted something that would be all red but with texture and, of course, something that would represent textile techniques of the lowlands. But, of course….simple warp floats! 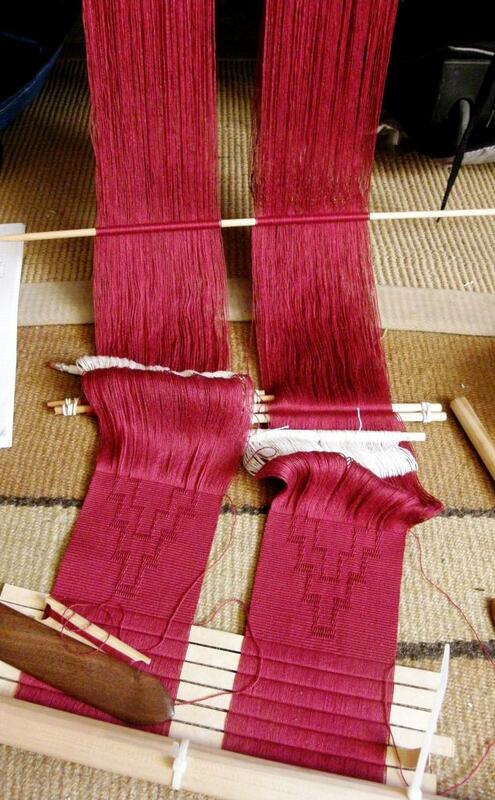 Some time ago I had woven the placemat, above, using a two-color simple warp float technique. I copied the pattern from a cotton bag from tropical lowland Peru that Teyacapan shows on her Flickr page. 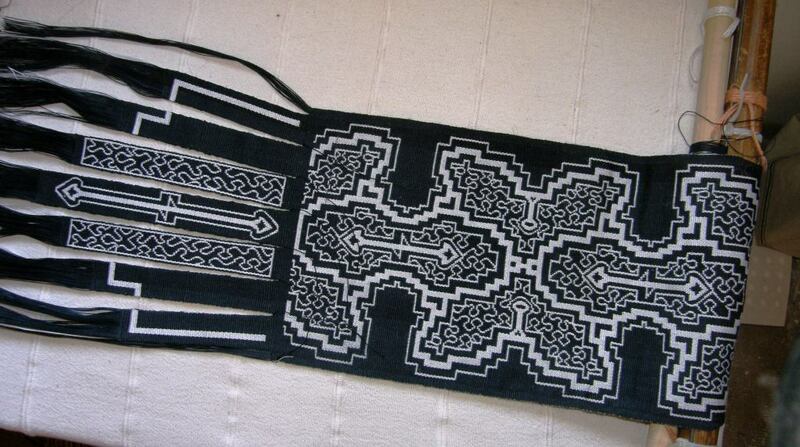 The design is one that I have also seen painted and even embroidered on Shipibo cloth. 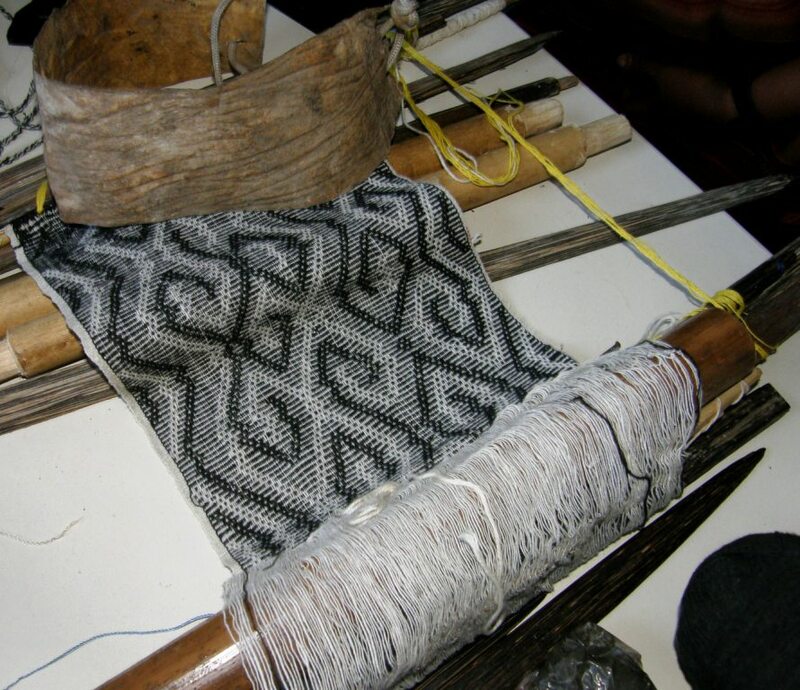 At the Encuentro de Tejedores that I attended in Cusco in 2012, I was able to observe Matsigenka backstrap weavers from Bajo Urubamba creating striking black and white pieces with their handspun cotton. 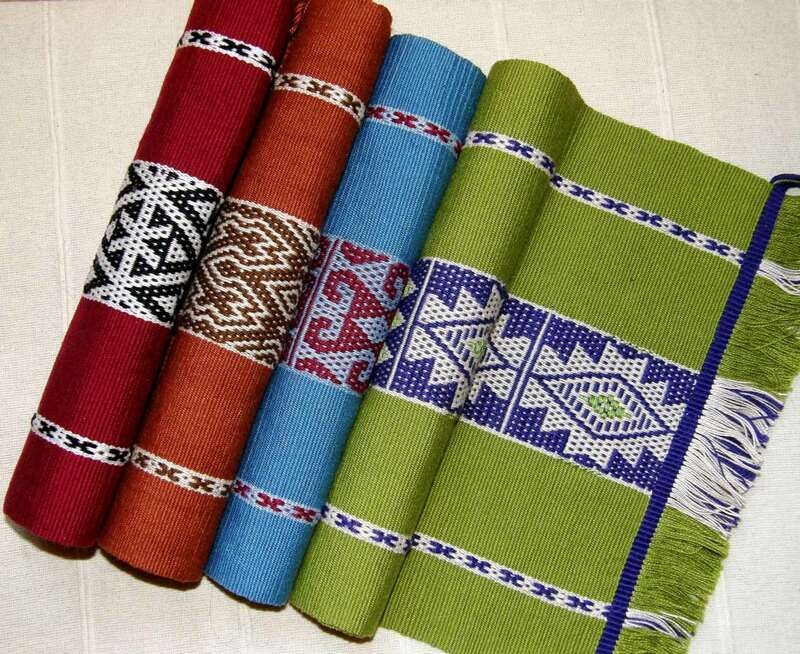 The pieces were decorated with patterns that were created from simple warp floats. 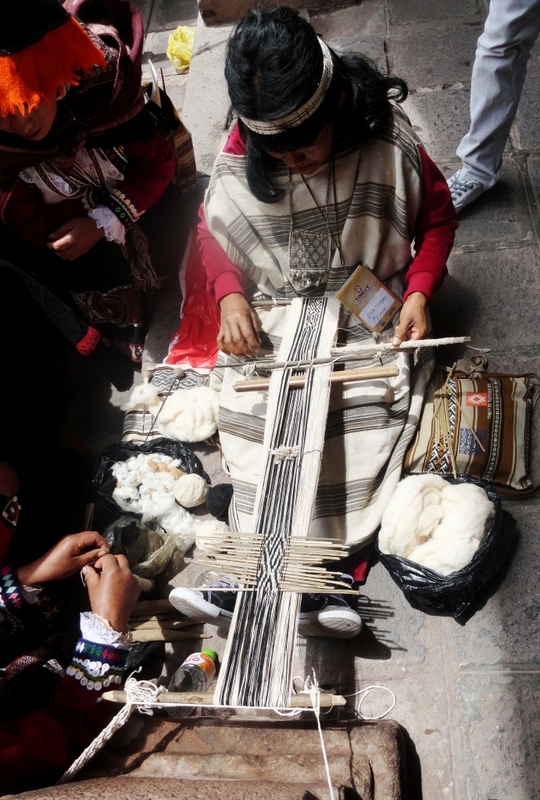 The picture above was taken at Tinkuy 2013 in Cusco and shows a weaver from Pacaya, in tropical lowland Peru, weaving a warp float pattern with handspun cotton on a backstrap loom. It isn’t necessary to have two colors to create patterns in this structure. If I used an all-red warp, I could create patterns of raised red-on-red….textured patterns rather than colored ones. I also had a Mexican sash that my friend Annie MacHale had given me way back in 2010. I then remembered that weaving a single- colored piece with warp float patterns had been on my to-do list for some time. It was all coming together nicely! 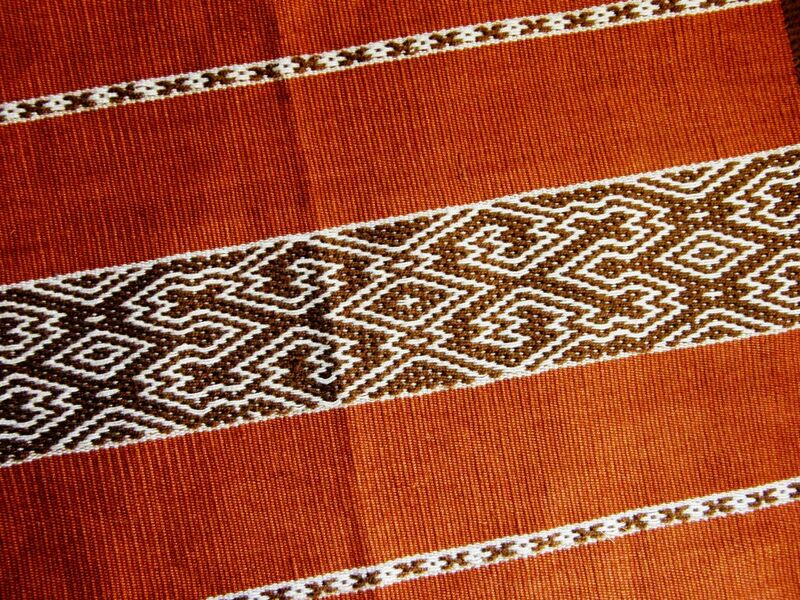 The weaver of this Mexican sash has alternated a heavy warp thread (doubled threads) with fine to create a high-relief pattern in white on white. Above, you can see my red experiments…the hemp twine wristlet structure and the red-on-red simple warp floats. I experimented with floating pairs and floating single threads and decided that single was the way to go. I wanted the pattern to be fairly delicate and subtle so as not to interfere with all that is going on in the main black-and-white panel. I decided to weave the solid lines of the main panel with the arrow motif in the center. I set up both panels on the one loom in the same way that I had done for the first wall hanging. This would ensure that both came out the same way. You’ll have to trust me when I tell you that these panels are deep red and not the weird pinkish-red that you see here. Now it is time to start sketching ideas for the weft-twined pattern that will go across the top of the finished three panels. 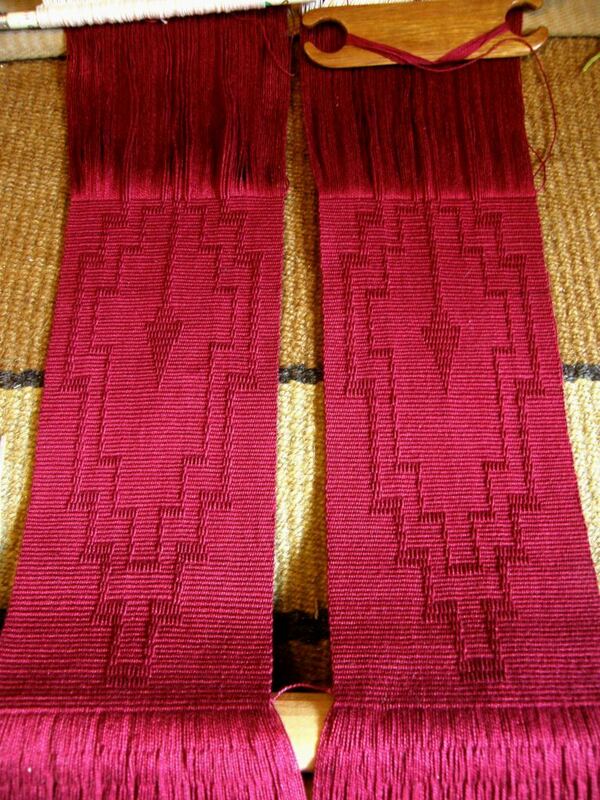 I remember I had a heck of a time with the twining on the first wall hanging trying to group the warps correctly so that the twined width matched the woven width. Hopefully it won’t take as many attempts this time to get it right! And in my spare moments I doodle and think about wall hanging number three…the ikat one. Luckily I have a giant cone of thread and a a huge roll of ikat tape (thank you Betty!). I expect there to be a few do-overs for that one! 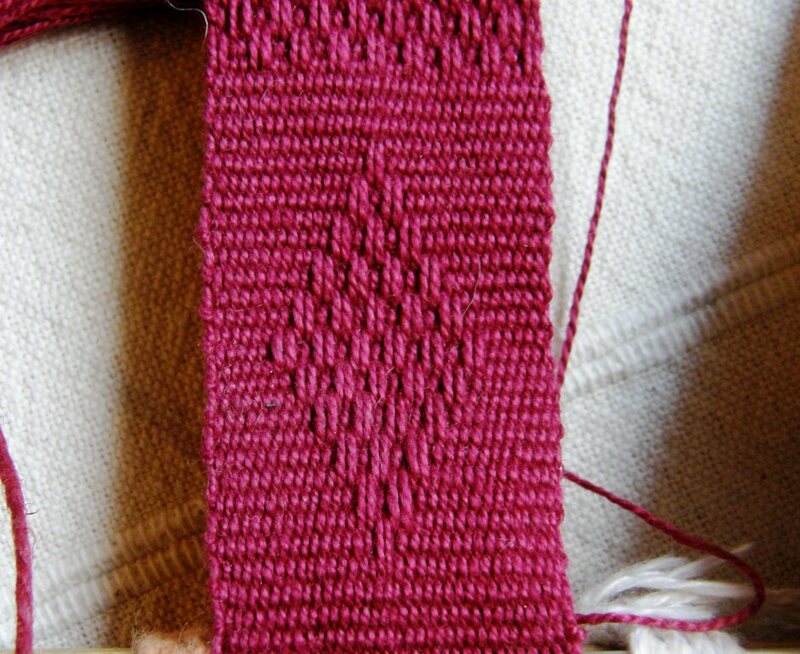 I am also hoping to use supplementary-weft to create patterns on that piece. These ideas are just sloshing around in my mind for now but I hope to base the overall design on hook motifs in positive and negative space like the ones I played with recently in silk supplementary weft on cotton… Then there will be the third series of wall hangings in which I hope to put what I learned with my ticlla (discontinuous warp) experiments to use….using wool and the red-black-and-white combo, of course! I have spent a lot of time putting that big bag of tricks together. It is nice to be able to use these experiments to create bigger things. I look way, way ahead and I get excited about all these projects as I inch my way along! 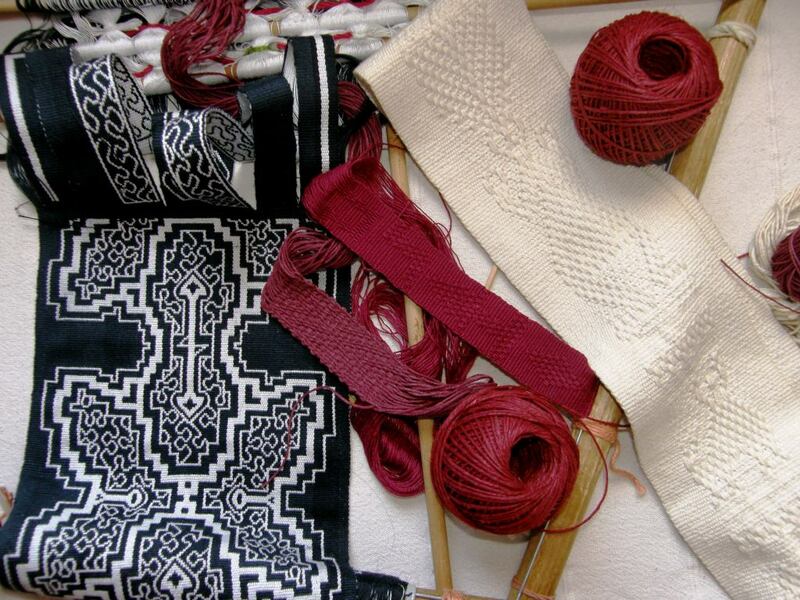 Love this post packed with your very cool weavings! Hi Janet, looking forward to weaving with you this fall and seeing what you have been up to you with your amazing handspun. Your bag of tricks must be very large indeed — you keep posting so many wonderful photos of your weaving and that of others. 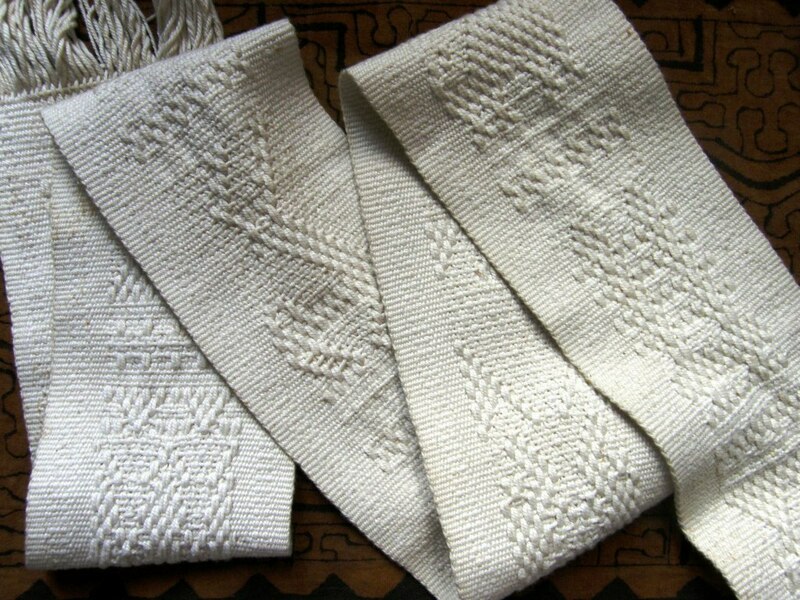 On a couple of my white-on-white inkle bands with warp float patterns I used thick wool with z-twist and thin with s-twist. The opposite spin adds another interesting feature to the thick-thin texture. I really like the woven tabs on your wall hanging. Would love to see apicture of your white inkle with the opposite twist, Fr Kyriakos. Unfortunately, I did take any photos at the time I still the white on white pieces. I have started a new one and will send a photo when there is a little more length. I love seeing these masterpieces take shape! I hope you’re saving that wristlet technique in your bag of future tricks…what a little gem. I need to practice the wristlet technique with other materials and see how that looks. On pieces I have seen the twined part has a more raised affect and I wasn’t able to achieve that with the hemp twine. It is indeed a little gem and the way the wristlets are finished is very special too. Absolutely stunning, this Shipibo piece, with that awesome fringe. It is really turning out gorgeous. I can’t wait to see what you conjure up for the ikat piece. I really love ikat. Thanks, Kristin. I finished the red panels last night. These zoomed along compared to the double weave pick-up! Under electric light last night I couldn’t see the pattern in the red panels at all! I was relieved this morning to see that they had “reappeared” as natural light cast shadows across them. I have always loved your work and so appreciate how you share your knowlage with others. I may have missed it but could you share (a video would be great) how to set up and use all those pattern sticks. I just can not figure it out. Thanks for all your work. I might do a video for stick storage for simple warp floats on a two-shaft loom which will be more meaningful for you, I think. You will see that the wristlet loom does not have any shedding devices. The pick-up is worked on a closed shed. 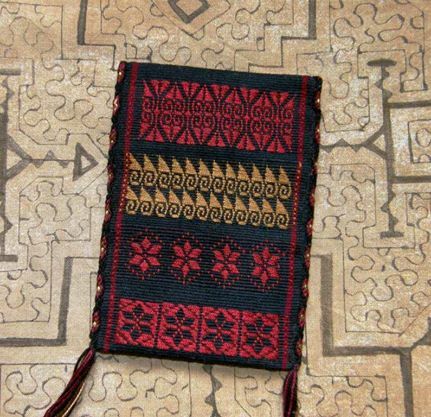 Laverne, your Shipibo-inspired piece is so lovely. It’s the perfect balance of positive and negative space, and you did a fantastic job designing the pattern. The Amazon wristlets are so intriguing. Would you mind explaining the structure in more detail? Do you twine the warps manually, or use cards to speed things along? I think that your experiment in the technique is beautiful, even if it isn’t the right fit for the panels. Thank you for the kind words. The wristlet technique does not use cards for the twining. They are just simple leno type twists and I used the tip of one of the storage sticks to pick the warps from a pair in such a way as to have them twist this way or that as required by the pattern. Only some of the ends are twisted…the edge ones always are and the others that need to be twisted change from shed to shed. Some are twisted and some are not. 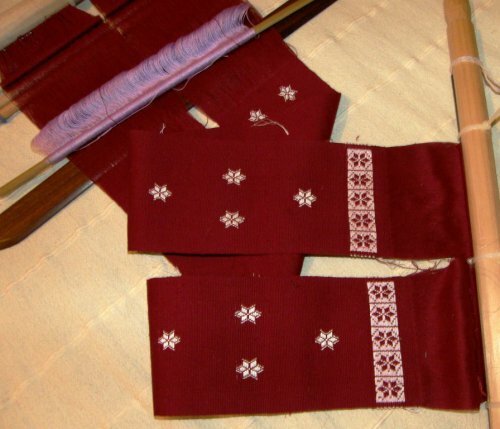 In between the pairs of twisted or twined warp ends there is a “half basket weave” (Samuel’s wording). High relief pattern, (the same color of background and motif) is so beautiful. It will make really pretty shawls and shoulder bags. I really like it Laverne!